Do you like being on the cutting edge? Bowhunting technology has come a long way in the last century and broadheads are no exception. Combining aerodynamics with powerful cutting blades, mechanical broadheads maximize a hunter’s biggest advantage: innovation. Humans have been getting better at hunting for tens of thousands of years because we’re always improving our technology, looking for the next big invention. Mechanical broadheads are one of those inventions. They’re a great option to take your hunt to the next level. For us there are five specific models that really stand apart. After a review of the technology behind mechanical broadheads and what makes a good one, we’ll take you through each of the models and why they made our list. How do mechanical broadheads work? How do you sharpen them? How much energy is required to open one? Can I use them with my crossbow and my compound or recurve bow? Mechanical broadheads are a fairly modern invention in which the broadhead blades are actually retracted back into the ferrule. Before use the broadhead is narrow and circular like a field tip. When the broadhead comes into contact with a target, the force pushes the blades open. The idea is that mechanical broadheads have the accuracy of field tips while keeping the damaging and penetrative power of a regular fixed-blade broadhead. Mechanical broadheads are more aerodynamic and less likely to stray off course. The debate between mechanical and fixed-blade broadheads is a never ending one in the bowhunting world. One study actually suggests that mechanical broadheads are more successful in the field. Nevertheless, many hunters prefer fixed-blade broadheads. The benefit of fixed-blade broadheads is their reliability. There are no moving parts. There’s often just one piece. There’s nothing to malfunction which can be especially frustrating if it happens when you’re going after your trophy buck. Mechanical broadheads, on the other hand, maximize both accuracy and penetration. They are more aerodynamic and easier to group, but their wide cutting diameters on contact give them great penetration. This also allows for good blood trails. It really depends on your preferences. Fixed-blade broadheads are a safe bet. What you see is what you get. Mechanical broadheads have a lot of advantages, though, so spring for them if you don’t mind taking the risk they’ll malfunction. Unlike fixed-blade broadheads, you usually remove the blades from a mechanical broadhead to sharpen them. You then push them against a diamond stone or other sharpening stone (take a look at our broadhead sharpener reviews here). The difficulty with sharpening mechanical broadhead blades is holding them. They’re small, and you don’t want to hurt your fingers. You can use pliers, or you can opt for one of the many sharpening systems manufactured specifically for mechanical broadheads. They come with tools for holding the blades while you sharpen them. While holding the blade perpendicular to whatever you’re holding it with, press it too the sharpening stone with light pressure at a slight angle. Rub the blade down the stone away from you, lift it off the stone and bring it back. Repeat this action around five times, then turn the blade over and sharpen the other side. Do this with all the blades you need sharpened. It’s a common myth in bowhunting circles that mechanical broadheads require a prohibitive amount of kinetic energy to open the blades. As the myth goes, mechanical broadheads lose penetrative power because energy is lost just opening the blades. The truth, however, is that mechanical blades need as little as three pounds of kinetic energy to open. Considering 45 lbs is adequate to kill a large buck, losing three pounds of energy does not make much difference, especially if you are using a high-powered compound or crossbow. The short answer is yes. Mechanical broadheads will function with any bow. As mentioned above, they don’t require much energy to open, so they’ll still work fine with a recurve or longbow. Similarly, they won’t have problems with a crossbow. Some broadheads have different versions designed for different bows, but this shouldn’t be your top concern. First, make sure you’re getting the right weights for your arrows. Even more importantly, make sure you’re getting the right broadheads for your prey. For fixed-blade broadheads, more is better. This isn’t exactly the case for mechanical broadheads. Similar to fixed blades, mechanical broadheads with more blades will make better blood trails. They’re less likely to split muscle sinews that can close back up around the wound. The downside of more blades, though, is more moving parts to malfunction. The type of tip you want depends a lot on what you’re target is and what bow you’re using. Chisel points are shaped in such a way that they split open the hide and punch through bone. They work great with high-powered bows and on medium-sized game. Cut-on-contact points begin slicing the moment they contact your target. This increases their penetrative power, though they can more easily deflect off bone. For this reason they require good accuracy and are a great choice for traditional hunters with low-powered recurve or longbows. Cutting diameter refers to how wide the wound is that the broadhead creates. Large cutting diameters will leave bigger wounds and therefore better blood trails. They’ll also just do more damage. The downside to larger cutting diameters is that there’s more resistance on the broadhead, so you might get less penetration. They’re also more likely to strike bone. Mechanical broadheads usually have larger cutting diameters than fixed-blade broadheads because even if they blades are larger, they won’t affect how aerodynamic the broadhead is. Take note of how big the cutting diameter is when choosing yours. Broadhead weights range from around 75 grains to 150 grains. Heavier broadheads work better with heavier arrows, and lighter broadheads work better with lighter arrows. Lighter arrows fly faster and drop more slowly, so they’re more accurate. On the other hand, heavier arrows have more energy when they contact the target, so they penetrate a lot deeper. One hundred grains is the most common weight you’ll find. It’s a good middle ground in between these two qualities. If you plan to hunt really large game like elk or moose, though, you might want to spring for heavier arrows and therefore heavier broadheads, 125-150 grains. If you are a traditional bowhunter using a low-power bow like a recurve or longbow, you will be using lighter arrows and focusing on accuracy. Consider lighter-weight broadheads. Make sure you buy the best weight for your hunt. You can easily reuse most mechanical broadheads because you can both replace and sharpen the blades. They’re removable, so this isn’t a problem. It’s a good idea to check just how removable the blades are, though. Some are a real hassle while others are a simple job. Broadheads are only completely illegal in two states: Idaho and Oregon. That said, every state–and country for that matter–has different regulations regarding these kinds of arrowheads. Your jurisdiction may require broadhead blades to be a certain thickness or may dictate that they only be used with arrows of a certain weight or bows of a certain poundage. Mechanical broadheads might also be restricted to shorter seasons within the general archery season. Check your local laws before purchasing your mechanical broadheads. Rage always seems to be at the forefront when it comes to mechanical broadhead technology. Each model seems to have some new innovation that improves the broadhead’s effectiveness. In the case of the Hypodermic, Rage improved the Shock Collar that prevents the blades from opening too early. Their hybrid tip also maximizes penetration while maintaining accuracy. The Rage Hypodermic has the accuracy of a field tip while still managing a massive two-inch cutting diameter. That cutting diameter ensures a profuse blood trail, so your quarry will be easy to track. There are only two blades, though, which increases the chance you might split muscle sinew that can close up around the wound and hinder the blood trail. For a broadhead with a large cutting diameter, the Hypodermic has great penetration, too. The Rage Hypodermic is a high-quality broadhead, not a knock off, but you can easily reuse it. You can easily remove the blades and replace them without having to worry about complicated assembly or damaging the broadhead. This broadhead only comes in 100 grains. With its penetrative power, that should give you enough kinetic energy to still hunt large game, but if you are a traditional bowhunter looking for lighter weight, this isn’t ideal. Above all, though, the quality of the Rage Hypodermic is just really impressive. You can tell from the craftsmanship that they’re not only effective but durable too. 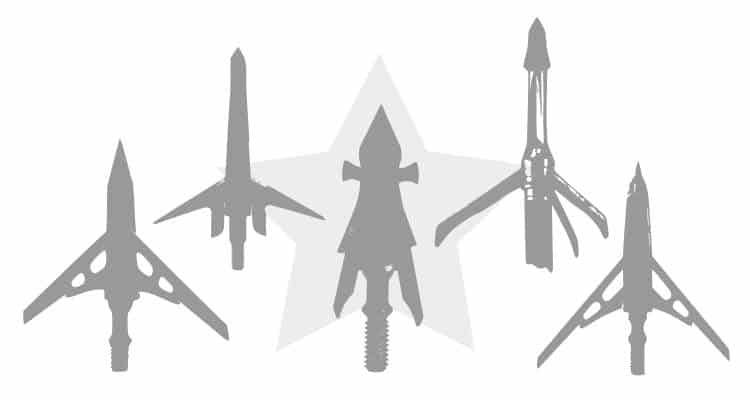 The ferrule of the Swhacker is made of the same anodized aluminum as aircraft, and it looks like a fighter jet. The sleek appearance of this broadhead is far from our favorite thing about it, though. Attached to the aluminum ferrule is a steel chisel point. That chisel point adds some punching power to this incredibly aerodynamic broadhead. Along with the chisel point, the Swhacker has two smaller blade edges called “wing blades” that don’t retract into the ferrule. Together, the chisel point and the wing blades allow the broadhead to punch through the tough hide and first set of ribs of the animal. Then the blades rotate open exposing the main blades which do the damage. The wing blades have other benefits as well. Because they’re actually just a part of the main blades, they help the main blades to open. Pressure against the wing blades causes the blade to rotate which exposes the main blades. On top of this, if the broadhead does malfunction and the main blades don’t open, the wing blades have a cutting diameter of one inch, so you’ll still get a blood trail. The Swhacker only has two blades. This increases the risk of a bad blood trail or deflection off bone. The main blades of the Swhacker have a huge two-inch cutting diameter, though, which minimizes that risk. The ferrule and chisel points are durable, and the blades are easily replaceable. You can reuse these broadheads on numerous quarries. They’re good if you plan to hunt a lot this season. The Swhacker 2-Inch only comes in 100 grains, too. This along with the chisel point make it a lot more ideal for high-powered bows. The idea behind the name “Swhacker” is that you can hear the blades reliably “swhack” open when they contact your target. The aerodynamics of this broadhead give it great accuracy. You can get groupings similar to field points. If you’re looking for a reliable but deadly broadhead this season, the Swhacker might be for you. Muzzy is a well-known name in the broadhead world, and the Trocar made our list for best fixed-head broadheads as well. The Trocar HB is the Trocar’s mechanical hybrid and retains the great things about it but adds that mechanical flare. The Trocar HB has mechanical parts, so it’s technically a mechanical head. Muzzy calls it a “hybrid,” though, because it does have fixed blades. It features two fixed blades with a one-inch diameter and then two mechanical expandable blades that open on impact for a 1-⅝” cutting diameter. The hybrid design is really cool. Not only do you get four blades that guarantee damage and an easy blood trail, but you get an arrowhead with benefits of both fixed-blade and mechanical broadheads. You get the reliability and dependability of a fixed blade along with the accuracy and penetration of a mechanical. The Muzzy Trocar HB loses points because it only comes in 100 grains. Plus, being a hybrid, its construction is a little complicated. You can replace the blades, but taking apart and putting the broadhead back together again is no small chore. You’ll also have to sharpen the fixed blades if you want to reuse it. The Muzzy Trocar HB looks straight medieval, like some sort of contraption knights would have used in the Middle Ages. It is, after all, a literal killing machine. The hybrid design makes it a great choice for anyone used to fixed-blade broadheads who wants to try out a mechanical without too much risk. It’s also a good mechanical option for low-powered bows like recurves or longbows. Rage managed to make our list again with the Bowhunting Xtreme. Like the Hypodermic, the Xtreme has a lot of unique innovations that maximize its effectiveness as a broadhead. The Bowhunting Xtreme features the same improved Shock Collar that other Rage broadheads have. This keeps the mechanical blades opening prematurely, so you have an accurate and penetrative shot. By far the most impressive thing about the Xtreme is its cutting diameter. It opens up to an enormous 2.3 inches. This is more than twice as large as some fixed-blade broadheads and insures a damaging wound and a good blood trail. Rage only offers the Xtreme in 100 grains, but it gains versatility elsewhere. You can order it in both cut-on-contact and chisel points. The cut-on-contact broadheads will maximize penetration and are great for traditional bowhunters. The chisel points punch through hard tissue and bone, so they’re good for high-powered bows. You can even order a specific crossbow model. The Xtreme only has two blades. However, if you get the cut on contact, you’ll have an additional plane of cutting surface, albeit with a small diameter. The swept-back angle of the blade makes the Xtreme aerodynamic and accurate. The blades are easily replaceable as well, so you can reuse this broadhead again and again. As the name implies, the Grim Reaper Whitetail Special is specialized for hunting whitetail deer. It’s great for high-powered bows and medium-sized game. It’s an accurate broadhead that gets results. The Whitetail Special is unique on our list in that it has a kind of combined cut-on-contact and chisel point. Immediately behind the chisel point are two “mini tip blades.” As you can imagine, the combination gives you some of the advantages of both. The chisel point keeps the arrow on course traveling through bone and tough tissue while the mini tip blades begin slicing for maximum penetration. Unlike a lot of mechanical broadheads, the Whitetail Special features three expandable blades. This does mean you’ll have to replace more blades if you want to reuse the broadhead, but it’s well worth it. With this you get the incredible accuracy of a field point and brutal three-dimensional wound of a fixed blade. This broadhead is a good bet if you’re concerned about blood trails. The Whitetail Special only comes in 100 grains, which makes sense since it’s designed for higher-power bows. The three blades open up into a large two-inch cutting diameter. If you’re a compound bowhunter looking to get a big buck this season, the Grim Reaper Whitetail Special is an option to keep in mind.